Great White Shark cage diving is one of the “must do’s” for anyone visiting Cape Town. 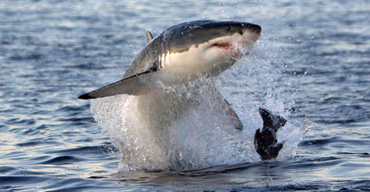 Shark Breaching is one of the hunting techniques that great white sharks use to surprise and kill its prey. Come witness it for yourself on our Airjaws Tour! We have the perfect Great White shark cage diving trips for you. Come shark cage diving and enjoy the rare Sevengill Cow sharks at Seal Island, False Bay. Wanna go Shark Cage Diving with the experts? Love great white sharks? Want to go on a shark cage diving or breaching trip with people that shares your love for them, then look no further! 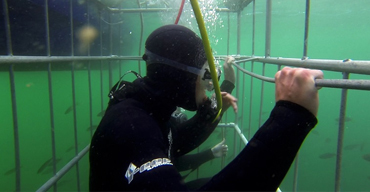 We are a top shark cage diving company operating in False Bay, experts since 1996. We specialize in shark cage diving, breaching, viewing and filming trips. Great White sharks are our life and our love and we are privileged to be able to share our passion and our knowledge with you. African Shark Eco-Charters vision is to provide a natural encounter with the great white sharks allowing you to observe social interactions and the natural predation behaviour on Cape Fur Seals in magnificent False Bay, through education and experience. To have a passion for sharks and other marine animals, portray it and to pass it on. To be completely honest and transparent with our guests. We will correctly inform guests of latest sightings, weather and prices etc. To ensure the highest possible standards in the shark industry. To be democratic: To promote good relationships within the company between individuals’ no matter our differences in race, background, beliefs and sexual orientation. To be non judgmental of the different cultures of our guests. They say that true passion is when you take what you love and turn it into your work and this is how African Shark Eco-Charters was born. We are privileged to be able to have done this. Being with the great white sharks is what we love. And we want to share this with you. For years now we have been changing perceptions and instilling a love for great white sharks in others. Whether it be our guests, photographers or film makers, they walk away with a positive attitude and in turn pass that onto others. We are a top shark diving company and we run the safest operation in False Bay. Our aim is for you to experience your great white shark breaching or cage diving trip in a natural environment, putting sharks first with our “first do not harm approach”, and managing our environmental footprint as much as possible. We will also not comprise your safety by going to sea in unfit conditions. We are environmentally sensitive and in 2009 we established a written environmental policy in order to manage and reduce our footprint. Why Choose African Shark Eco-Charters? Planning a shark cage diving/breaching trip and wondering which company to go with? Here are a few reasons to choose African Shark Eco-Charters. Also see ABOUT US under our portfolio. We are a first rate shark cage diving company and shark expert and owner Rob Lawrence personally takes a majority of the tours. Our testimonies and being the first choice to many of the top safari companies in SA, Namibia and Botswana speak for themselves. We operate from Simon’s Town, only 45 min from Cape Town. Why drive hours away to go shark cage diving? We dive 4-5 in a shark cage. Don’t be one of 8 in the shark cage! 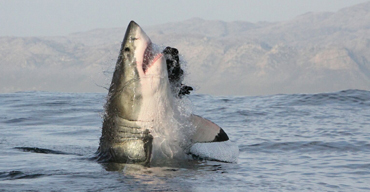 In peak season, you can experience great white shark cage diving and breaching. Eco-sensitive. Your shark cage diving trip is managed in an ethical, socially responsible manner. We only take small groups on our boat. We won’t squeeze in another guest, promise! We cater for 5-10 day great white shark cage diving trips, photographers, film documentaries & film shoots. the perfect choice when choosing a shark cage diving operator. or tell the world about your experience with us!